With 'Sorry to Bother You,' the first-time filmmaker and multi-hyphenate artist and activist is poised to speak, on his own terms, to the largest audience of his life. 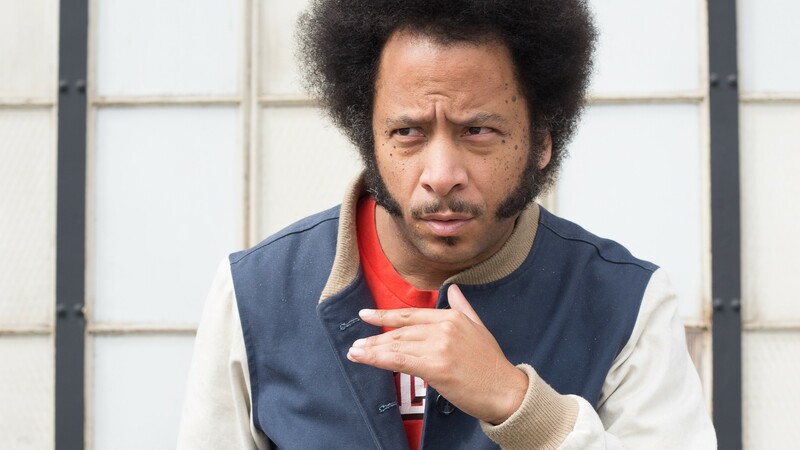 Boots Riley drew from his experience as a telemarketer to make his first film, Sorry to Bother You. In 1996, Boots Riley's music career was sputtering. The catalog of his revolutionary g-funk group The Coup was stranded amid record label mergers, and he contemplated retiring from rap. Instead, he took an unlikely part-time job: tele-fundraising. The multi-hyphenate artist and activist donned a headset at Stephen Dunn & Associates, a call-center in downtown Berkeley. A punk manager with an anarchy tattoo enticed workers with cash bonuses to "make the grid," office parlance for raising money. "Overhearing Boots on calls was a trip," said Eric Arnold, one of Riley's coworkers. "He had albums out, so it was the same gravely, raspy voice I knew from Genocide & Juice going, 'Sorry to bother you, ma'am, but...'"
Riley, once a newspaper salesman, calibrated his pitch for each project: Raising money for a local PBS affiliate, he'd call people and ask what they thought of the new Coca-Cola commercial programmed during NewsHour, saying budget constraints meant more to come. (There was no Coca-Cola commercial.) For a Los Angeles homeless shelter, he called people in Orange County and asked if they'd notice the uptick in car break-ins. "They'd go, 'Huh, no, I didn't know,'" Riley said, slipping into a conspiratorial tone as he sat outside a diner in West Oakland recently. "I'd go, 'Well we're an organization that understands this is something the police can't solve, so we're taking things into our own hands. We're going to move all of the homeless people from Orange County to downtown LA, teach them how to dress, how to bathe, and how to read the Bible.'" Riley has been a cashier, a printer, a dishwasher, and a door-to-door salesman, but he invoked his time as a telemarketer to make Sorry to Bother You — his electric, hallucinatory writer-director debut film about an Oakland telemarketer torn between unionizing peers and the "power caller" suite — because it's a workplace suffused with competition and myths of mobility, and it tempts artists to use their skills for deceit. "It was me using my creativity for manipulative purposes," he said of his call-center stint. "Like an artist who could make a cultural imprint instead figures out what font makes you buy cereal." Riley is a keen observer of how market forces undercut radical messages. Early Coup albums lacked printed lyrics due to budget constraints, so critics often neglected Riley's point of view, even erroneously describing him as another pimp-rapper à la Too Short. At the same time, he finds the aesthetic conventions of radical art unimaginative and, in terms of reaching people, self-defeating. Sorry to Bother You, then, might be the true coup of his career: poising Riley to speak, on his own terms, to the largest audience of his life. The years-long effort to make Sorry to Bother You is a story of Riley, in a mid- to late-career reinvention with little precedent, risking self-sabotage in his refusal to cede creative control. It is a deeply anti-capitalist film portraying labor organizing tactics including work stoppages, walkouts, and strikes. It is set and shot in Oakland. It has an ensemble cast. And it's backed by esteemed movie house Annapurna Pictures. It is also a comedy, inspired by magical realism, with jokes centered on horse dicks and a mansion full of white techies screaming the n-word after goading a Black man to reluctantly rap. Sorry to Bother You explores the central tension of Riley's career, his perennial concern about artists' role in racial justice and building working-class power. "You have to have something that you're more passionate about than your art," he told San Francisco State University students at a May screening. "There's no reason to do art for art's sake." Hence his eagerness to ascribe a point to the film: "There's a way to look at how fucked up things are through the lens of 'how can we leverage our economic power for change?'" He added, "That's what Detroit deals with — is just exposing the problem enough?" Detroit (Tessa Thompson) is a sign-twirler and an artist who moonlights with something called Left Eye while creating an exhibition about the exploitation of Africa's natural resources. Her boyfriend, Cassius Greene (Lakeith Stanfield), doubts its efficacy; she in turn questions his ascent on the call-center corporate ladder, imploring him not to use his new "white voice" at home. Also skeptical of Detroit's art and its political export is Squeeze (Steven Yeun), a traveling labor organizer with visions of a broader rebellion. "The conflict between Detroit and Cassius and Squeeze is very much like the conflict within myself," Riley said. "Whether my art is effective or if it even changes things." Riley, 47, was outside Pretty Lady, a modest diner near his longtime home. (He now lives in East Oakland.) When he arrived, in a battered Mercedes Turbodiesel from the 1980s, a friend with her young daughter greeted him and said, in one breath, that she's excited to attend the movie premiere and that they were at breakfast because, that morning, there was a shooting on her block. Riley was preparing for photographs with the help of a groomer hired by Annapurna. When she offered him a handheld mirror, he turned instead toward his reflection in the diner window and pulled an Afro-pick from his back pocket. Technically, Sorry to Bother You is set in an "alternate present-day in Oakland," a device for dramatizing recognizable features in absurd ways, but spending time in Oakland with Riley is itself a little surreal. When I interviewed him in 2014 at Brown Sugar Kitchen, Black Panther director Ryan Coogler, now a mentor, introduced himself. The next year we spoke at his former downtown office, a room outfitted in comically spartan fashion with one tiny school desk. Outside the Pretty Lady, he offhandedly referenced working at UPS in the early 1990s. Minutes later, a UPS truck slowed on Peralta Street to honk. Riley returned a familiar wave and then looked me in the eye, as if he was about to wink.